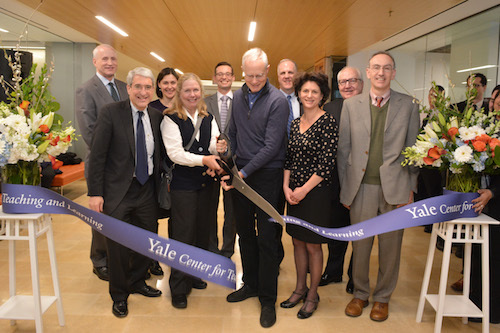 Yale’s Center for Teaching and Learning (CTL) celebrated its grand opening on Jan. 27 in 24,000 square feet of renovated space in Sterling Memorial Library. From dedicated tutoring rooms to public touch down areas, the CTL has created a unified hub of activity dedicated to advancing the University’s teaching and learning mission. Deputy Provost for Teaching and Learning Scott Strobel, Executive Director of the CTL Jennifer Frederick, and Executive Director for Digital Education Lucas Swineford welcomed more than 700 people from the Yale community during the celebration, including President Peter Salovey, several deans, faculty, students, and staff. The community explored the space, which is designed to create a more collaborative environment for students, faculty, and postdocs as they work with the center’s staff on teaching, tutoring, writing, and technology initiatives. The $10 million capital improvement project kicked off in August 2014. The project was led by Yale Facilities. Newman Architects and Standard Builders were selected to complete the project which included renovations to the Irving S. Gilmore Music Library and the creation of a central corridor from the newly opened 301 York St. entrance to the Nave in Sterling Memorial Library. Polak noted during his remarks that many people contributed to the establishment of the CTL and that two key people helped make the physical space a reality. “One is Yale’s secret visionary, who is not always visible, but understands spaces and, frankly, had the idea for this space,” said Polak, as he acknowledged Lloyd Suttle, deputy provost for academic resources. Polak also said the “other force behind” the project was Strobel, who shares his passion for education and teaching. While the space is designed to showcase teaching and learning, Newman Architects wanted to ensure a sense of continuity between the CTL and the Nave by using oak, limestone, and metal — materials also found in the restored Nave. The firm selected flexible furniture manufactured by Herman Miller and Knoll. Specific pieces include works designed by Ray and Charles Eames and Eero Saarinen, the architect of Ingalls Rink and Ezra Stiles and Morse Colleges. The CTL has 20-plus rooms or areas designed for collaborative meetings, classes, workshops, and one-to-one or small group tutoring. Each room incorporates mobile furniture to allow people to easily arrange the rooms in new ways. Smaller rooms have fixed screens and writable surfaces on the walls, and larger rooms use media carts in place of fixed projectors. “Our center values collaboration, transparency, and human connection,” said Frederick, as she described the role of the CTL on campus. Frederick stated that the CTL works with undergraduates on writing, tutoring, and academic strategies, with graduate students and postdocs on writing workshops and teaching skills development, and with faculty to showcase excellent and inclusive pedagogy. The CTL will host several key events throughout the spring semester to feature the new space, including Faculty Bulldog Days at the end of February, the Diversity and Education Series with the CRLT Players from the University Michigan in March, and the Spring Teaching Forum led by Interim Director for Graduate and Postdoctoral Teaching Development Kaury Kucera toward the end of the spring semester. “We are so happy today to be celebrating this new space that we have created, with so many partners, for the CTL to help us achieve the university’s vision for continued excellence in teaching and learning,” said Frederick, as she concluded her remarks. To learn more about the CTL, located at 301 York St., visit the space and watch the following video: An Introduction to Yale’s Center for Teaching and Learning.